As a gluten-free eater, now and then you come across a product that completely knocks your socks off. Since very few have mastered the art of gluten-free baking, this experience doesn’t happen often. However, last year, I was lucky enough to whip up the single best gluten-free cupcakes I’ve ever eaten, let alone made myself! 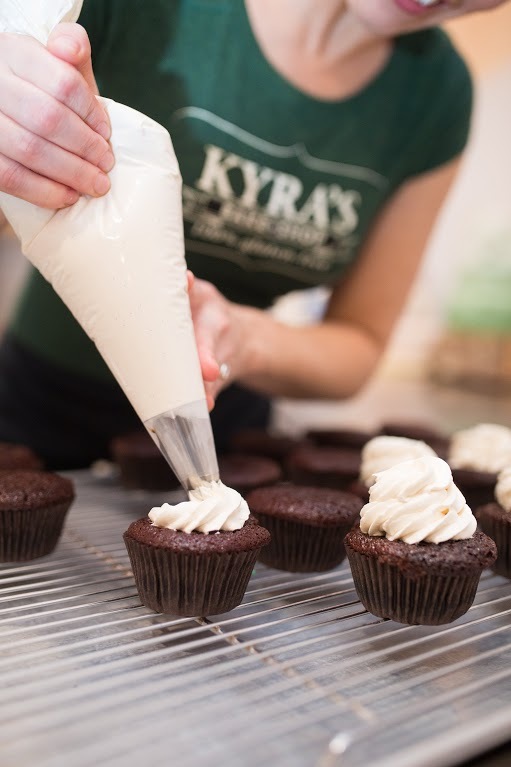 I ordered a box of Kyra Bussanich’s cupcake mix, devoured it, and ordered another box a few weeks later. 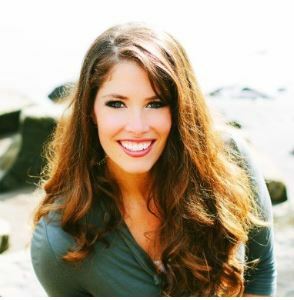 Since first discovering, and interviewing, Kyra I have stayed up to date with her on social media. 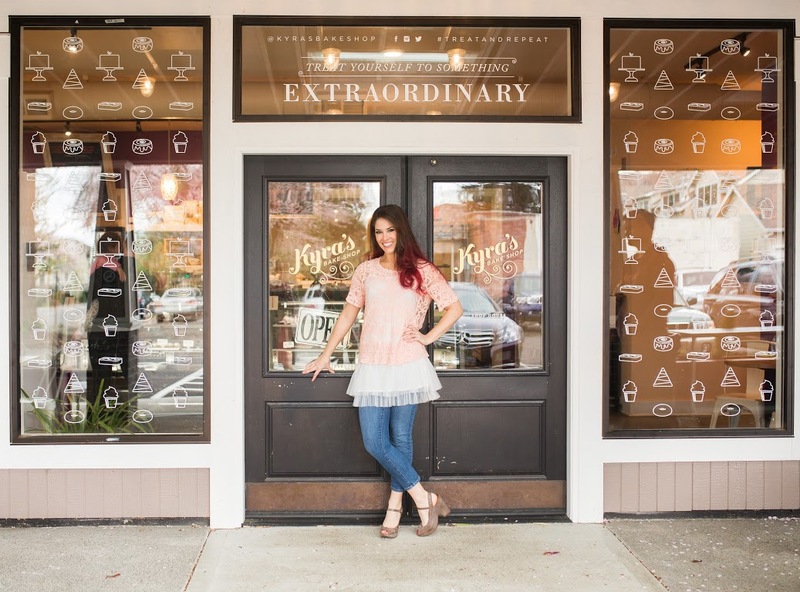 Kyra’s posts ooze both positivity and passion, and I couldn’t wait for the chance to connect again to hear about what she’s been working on lately. Q: It’s been almost 2 years since we last spoke, can you believe it?! 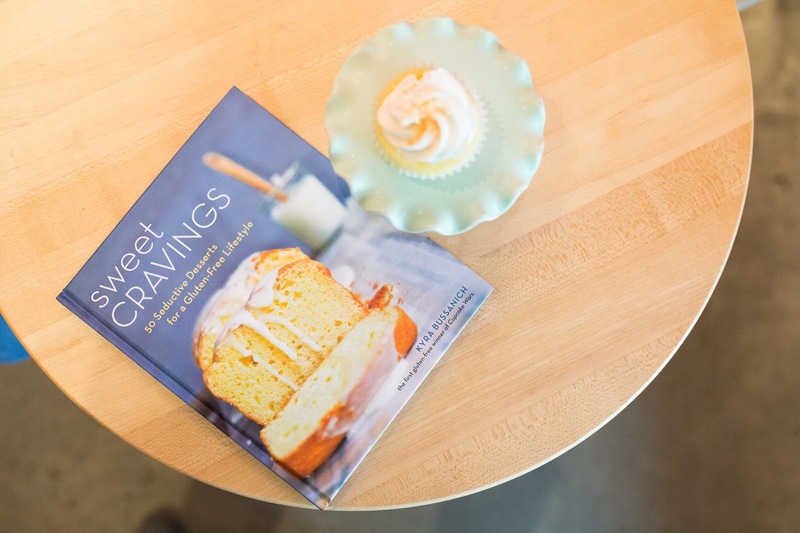 At the time you had recently launched your first cook book “Sweet Cravings: 50 Seductive Desserts for the Gluten-Free Lifestyle.” How was the cookbook received? What kind of feedback have you gotten? A: I’ve gotten really good feedback. Of course, I have had people tell me they’re angry that I didn’t include my cinnamon roll recipe in it, but I really wanted this to be a cookbook that was approachable and encouraged people to have success in their gluten-free kitchen. I also realized I need to publish an errata; when the book went from copy edits to manuscript, some of the weights of ingredients were changed and I didn’t notice that had happened until it was already published. So, I’ve been picking through the cookbook since to see what recipes I need to revise to make them true to my original. What’s been really special is that I’m getting messages from people all over the world who are loving the cookbook. It’s been amazing to see that people from other countries are not only finding the cookbook, but using it and enjoying the recipes. Q: What have you been working on since we last spoke? A: Oh my goodness, so much. I opened a facility that is 5x the size of our original store. We still do pastries, but we added coffee service, cocktails, soups, salads and sandwiches, so we’re a full cafe now! A: It really is. It’s been fun to expand our offerings. Because while I love me a good cinnamon roll, that doesn’t mean I want to eat one every day for lunch, and that’s what was happening. I’d get so caught up with the bakery that I’d forget to bring a lunch and I would resort to eating pastries every day. So, since we’ve expanded, I have been able to think about what healthy foods I want to eat every day and I have created a menu that reflects that by offering a variety of soups, salads and sandwiches. Q: That’s great! I wish I lived close enough to check it out. So, did you opened up a new facility or you just re-did the old one? 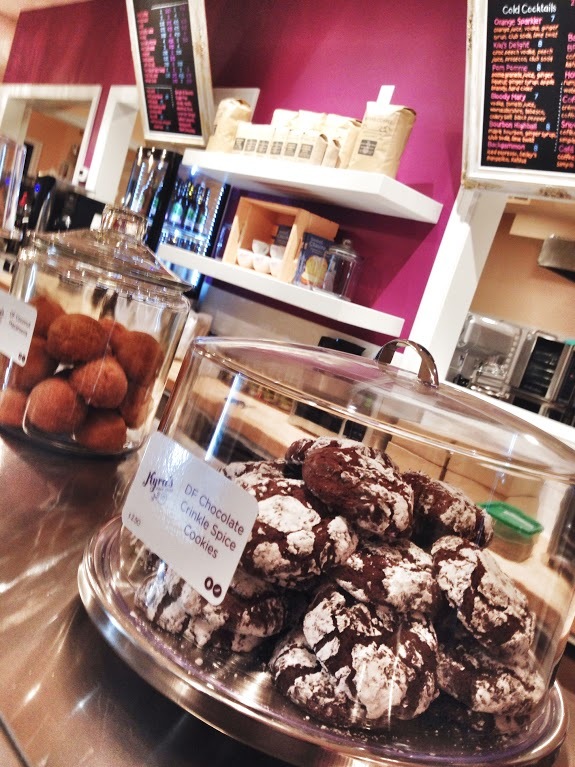 A: We opened up a new facility that is right around the corner from the original bake shop. We closed the original shop when we opened this larger facility. The location has served us well because when clientele come to the old shop and see the sign that says “we’ve moved!”, they only have to walk around the block to find our expanded presence. It’s not like they have to get back into their car and drive for another fifteen minutes. Q: I’m sure the location has been huge for keeping your customers happy. So, how has the store been received?! A: Excellent. The community has been super excited and supportive. We didn’t even send out a press release to announce the expansion of products and we’ve been really busy. Before we opened it up, my husband and I were doing forecasting about what we thought we would sell and I’m seeing that we’re doing a lot more lunch, and a lot less coffee, than I originally expected. Q: That’s really interesting. So, what else have you been working on? Any new recipes up your sleeve? A: Well, I’ve been playing with gluten-free croissants. I have a phenomenal recipe; the dough looks and acts like regular, gluten-based dough. I am just figuring out how to scale it up since the entire laminating process takes two days to make fourteen croissants. I’m looking into how to produce more while maintaining the same quality. I’m also looking for a new, gluten-free facility to produce our cinnamon rolls for us, since that is a very labor-intensive process as well. Right now, we’re spending about 42 hours a week just rolling the cinnamon rolls; this doesn’t even include scaling, mixing, baking or frosting. We sell out every day, and it’s one of the items that we do ship, but we are constantly back-ordered. Q: Wow, that definitely is a good problem to have. So, when we last spoke, you were thinking about opening up a second bakery. Has that been put on the back-burner since opening the expanded shop? A: Yes, definitely. I think at the time, I was picturing another small shop. What I really wanted to do was dial in the experience the customer has. So, our next goal is to decide if we want to open up another small, satellite bakery where we’d produce everything at our current shop to send off to other shops, or simply create the current experience in other stores across the country. We’re thinking about how to maintain growth, keep quality, and still maintain our labor costs. It’s harder than it sounds as I’m learning. We’re refining a lot of our procedures and really dialing that in. Q: That’s great. What’s the most popular product you sell? It sounds like it’s the cinnamon rolls? A: Yes definitely. 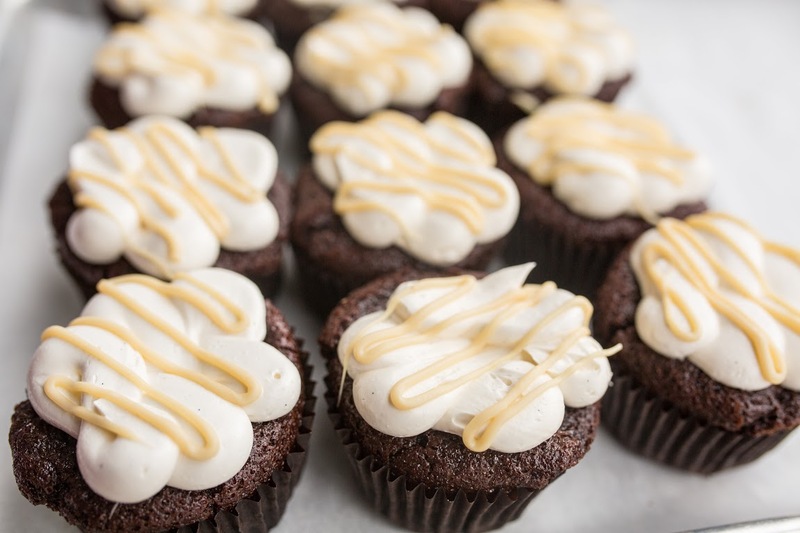 That is followed by our dairy-free Hot Chocolate cupcakes; it’s a chocolate cake with Italian marshmallow meringue on top. 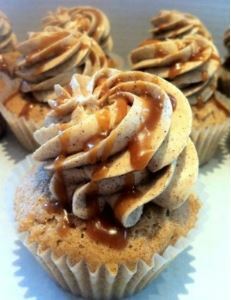 Also, anything that we made on cupcake wars has been really popular, or anything with salted caramel sauce in it. For example, we have a big boy we named the “Tall Dark and Handsome” cake, or TDH for short. The whole cake weighs in at 20lbs and it feeds 60 people, but we sell it by the slice. Each slice feeds about 4-6 people. 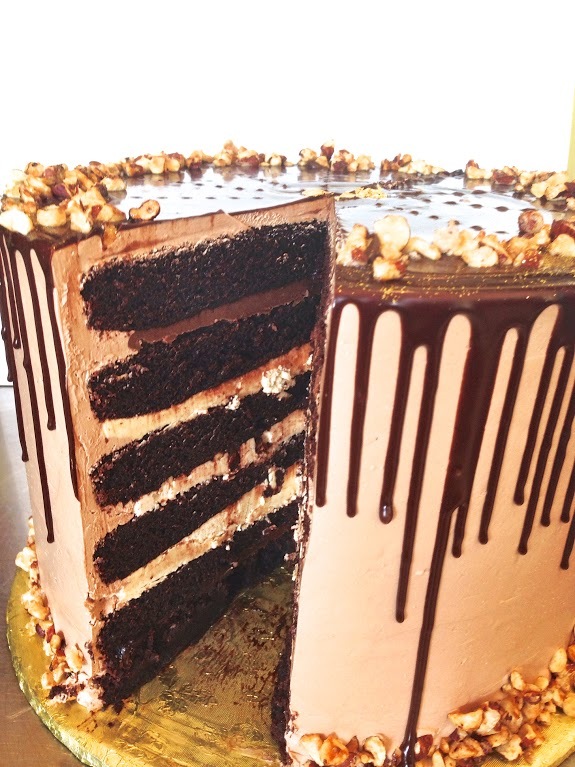 The TDH is 6 layers of rich chocolate cake alternatingly filled with salted caramel buttercream, hazelnut crunch buttercream and hazelenut dark chocolate ganache. The whole thing frosted in espresso buttercream, drizzled with dark chocolate ganache and garnished with candied hazlenuts and edible gold leaf. It’s amazing! A: It is and it’s been fun because I’ve been able to be a little sassy with it. Q: That is hilarious; I love it! Any plans to appear on cupcake wars again? A: Not that I know of right now, but you never know what the future brings. I’d much rather do a different type of show than another competition though; something more educational or fun, and focused on the food. Q: That would be great. Have you recently discovered any brands or products that you feel are worth sharing? A: Yes, so many! 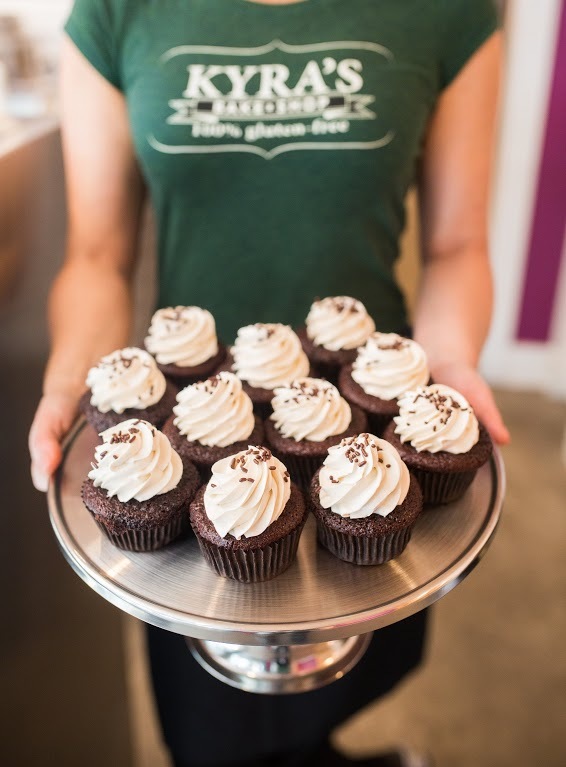 There’s a local company Jacobsen Sea Salt that has a ghost chili infused salt that adds a nice hit of spiciness to whatever you’re making, and we use their stumptown espresso salt to finish a few of our darker cupcake flavors. I also am obsessed with Lesley Stowe’s Rosemary Rasin Oat Crisps (made with gf oat flour); slather it with drunken goat cheese or Kerrygold Butter, and it’s a great appetizer! I also carry Florida’s Natural organic fruit bites in my purse for when I’m out and about and my blood sugar is low. It’s like candy, but in small pouches so I don’t over-indulge. In terms of non-edible products, Red Apple Lipstick has this amazing color called Cranberry Magic that I love. Acure Organics makes great lotions and face creams; they are all gluten-free, vegan and organic. Plus, they’re reasonably priced which I love! Q: Those all sounds great! I know you mentioned that your husband was always very supportive of your career. I’m sure that made it a lot easier to take the risky step of opening your own business. 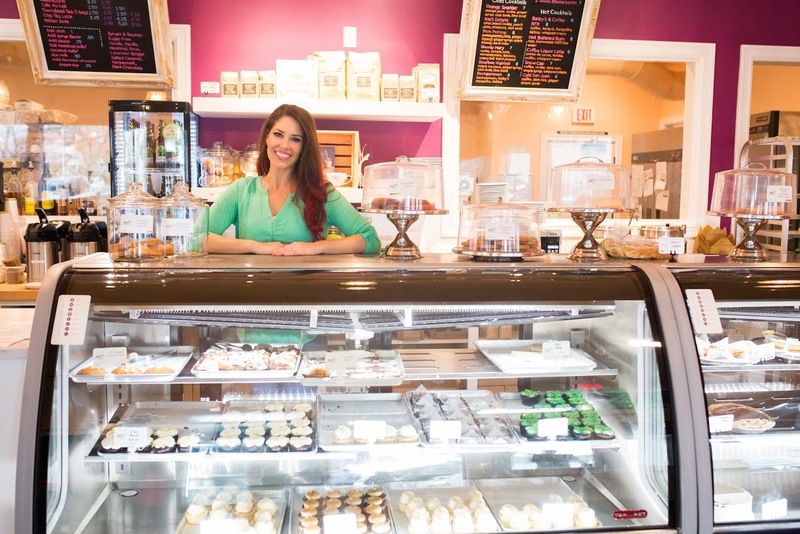 Do you have any advice or wisdom you’d like to pass on to those thinking of taking the plunge and opening their own bakery? A: It’s tough because there’s that fear of “what if I try this and it doesn’t work out.” But I decided to think about the worst-case scenario and, for me and my husband Jason, it was needing to move in with his parents. I had to think about whether I could live with the consequences that would result if I tried to open my own business and focus on it full-time and it didn’t work out. I realized yes, the risk was worth it. But, I also don’t have kids so it was easier. We’re also fortunate that Jason and I have parents are nearby. So, the worst case scenario that could have happened actually did happen briefly, in the beginning of starting the bakeshop, but we survived. One important thing about succeeding in business, whatever industry you’re in, is the need to keep going. So, I think that it’s essential to have someone to support you – even if it’s just emotionally – because starting a business is tough. You have to be available 24/7 to troubleshoot, and you’re constantly learning as you go. People will ask me how I have a work-life balance and, right now, I don’t. I don’t have a social life; it’s all work, and that’s okay for now but I know that I won’t want it to be this way forever. My best advice is to figure out what your strengths are, and are not, so that you can surround yourself with people with opposite strengths from you. That’s how you grow. I know a lot of people who feel like they need to be the best at everything and that means their company can only grow as big as that one person is able to. When you surround yourself with people with different strengths, you see such growth potential. You need to surround yourself with either someone who can tap you out and let you take a break, or someone who will remind you why you wanted to do this in the first place. For instance, I am good at coming up with flavors and creating recipes, but I am not as good at decorating cakes. So, I hire people who make incredible, artistic cakes and it makes me and my customers happy. If I had to create the recipes and flavors, and then decorate the cakes, we’d have some pretty messy-looking cakes and a lot fewer recipes to offer our customers. While there will be days where you’ll question if it was the right decision, I definitely encourage people to start their own business because it teaches you what you enjoy doing.